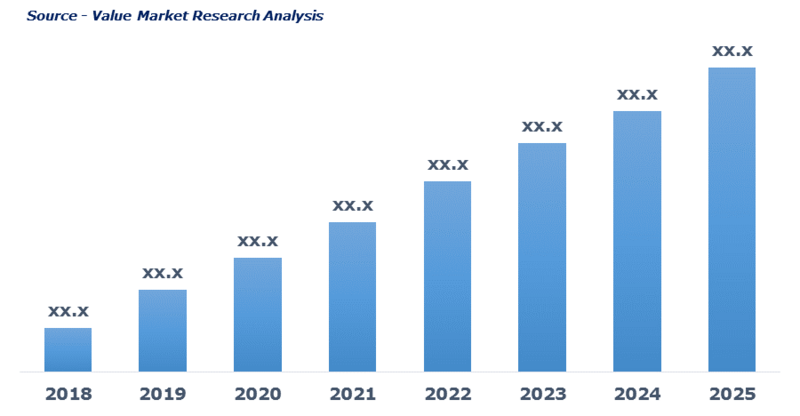 As per this study, the Global 3D Cell Culture Market was valued USD 744.3 MN (by revenue) in 2018 and is anticipated to reach USD 1,920.2 MN by 2025 with a CAGR of 14.5%. 3D cell culture is an artificial environment for in-vitro cell culturing that includes better cell interaction in all three dimensions. It includes cell culturing within scaffold leading to 3D growth of the cell or tissue. 3D culture overcomes the drawbacks associated with 2D cell cultures and more effectively stimulates cell morphology, adhesion, and its proliferation. The market is experiencing fast paced growth owing growing demand from cancer research institutes, laboratories, and pharmaceutical companies. Rising prevalence of cancer followed by growing demand for organ transplantation and tissue regeneration is again boosting the market growth. Also, growing funding for cancer and stem cell research is likely to foster market growth in the forecasting period. Growing demand of efficient culture to study drug doses is again pushing the market demand uphill. This detailed market study is centered on the data obtained from multiple sources and is analyzed using numerous tools including porter’s five forces analysis, market attractiveness analysis and value chain analysis. These tools are employed to gain insights of the potential value of the market facilitating the business strategists with the latest growth opportunities. Additionally, these tools also provide a detailed analysis of each application/product segment in the global market of 3D cell culture. The broad 3D cell culturemarket has been sub-grouped into type, application and end-user. The report studies these subsets with respect to the geographical segmentation. The strategists can gain a detailed insight and devise appropriate strategies to target specific market. This detail will lead to a focused approach leading to identification of better opportunities. Furthermore, the report comprises of the geographical segmentation which mainly focuses on current and forecast demand for 3D cell culturein North America, Europe, Asia Pacific, Latin America, and Middle East & Africa. The report further focuses on demand for individual application segments in all the regions. The report also covers detailed competitive landscape including company profiles of key players operating in the global market. The key players in the 3D cell culturemarket includes 3d Biotek LLC, Advanced Biomatrix, Inc., Becton, Dickinson And Company, Corning Incorporated, Kuraray Co., Ltd., Lonza Group Ltd, Merck & Co., Inc, Synthecon, Incorporated, Thermo Fisher Scientific Inc. And VWR Corporation. An in-depth view of the competitive outlook includes future capacities, key mergers & acquisitions, financial overview, partnerships, collaborations, new product launches, new product developments and other developments with information in terms of H.Q.